The GAA says that statistics show that nearly 50% fewer cards have been handed out in this year's Football League compared to last season, despite the introduction of the black card. 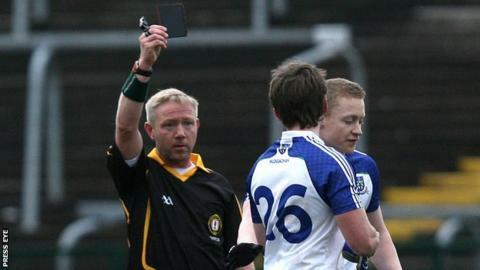 A Croke Park statement on Thursday said this year's League, had on average, less than one black card per game. The actual average statistical figure was .8 of a black card per match. The statement said the average number of cards per game in this year's League was 4.89 as opposed to 8.32 in 2013. According to the Central Competitions Control Committee, the yellow card average is down from 7.78 per game in 2013 to 3.79 this year. Double yellows are said to have halved from .36 last year to .18 this year while the red card figure has dropped from .18 per game to .12 in this year's competition. According to the Central Competitions Control Committee, the number of scores in this year's League has represented a 10 per cent increase on 2013. "In the 2014 leagues, the total aggregate scores [goals and points combined] per game played was 32.77 points," added the CCCC statement. "This was an increase of almost 3.5 points per game on that recorded in the 2013 leagues and 4 points per game on the 2012 totals. "The instance of goals scored rose from 1.79 per game in the 2013 leagues to 2.38 per game in 2014 with individual points scored rising by an average of 1.7 per game." The statement also says that compared to the 1993/94 Football League, this year's competition has 40 per cent more scores. "At that time, the total aggregate average of points per game was only 23.15, well over 9 points less than in 2014." The GAA's release of the statistics is unlikely to convince those who feel that the introduction of the black cards has only increased the confusion around on-field discipline in gaelic football.